Dr Michael Oellermann is a Postdoctoral research fellow and has a broad interest in understanding the mechanism that drive species adaptation across various organisational levels. 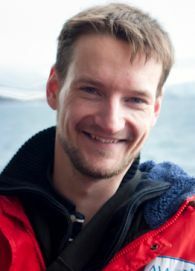 During his PhD at the Alfred Wegener Institute for Polar and Marine Research, Germany, he developed a particular expertise in the thermal biology of marine cephalopods and fishes, involving sea-going research and collaborative research visits at La Trobe University, Melbourne, the University of Auckland and IMAS. Following a patented innovation during his PhD, Michael led an industry project to develop a commercial apparatus to study blood oxygen function. He was then awarded with a Research Fellowship by the German Research Foundation to resume his scientific career at IMAS. Before joining IMAS, Michael completed his undergraduate studies in biology at the University of Düsseldorf, Germany and further specialised in marine biology and animal physiology at the University of Bremen. He then obtained a Postgraduate Diploma in Marine Science at the University of Wellington and took a technical research position at the University of Auckland, New Zealand. He then returned to Germany to complete his Diploma and PhD at the Alfred Wegener Institute for Polar and Marine Research to study genetic and physiological processes explaining thermal adaptation of cuttlefish and Antarctic octopods. Following his PhD, Michael led a technology transfer project at Loligo Systems ApS in support by the Danish government. He was then awarded with a Research Fellowship by the German Research Foundation to study the physiological and behavioural responses of spiny lobsters and their implications to climate driven range shifts at IMAS. Oellermann M, Lieb B, Portner H-O, Semmens J, Mark F: Blue blood on ice: modulated blood oxygen transport facilitates cold compensation and eurythermy in an Antarctic octopod. Frontiers in Zoology 2015, 12(1):6. Oellermann M, Strugnell J, Lieb B, Mark F: Positive selection in octopus haemocyanin indicates functional links to temperature adaptation. BMC Evol Biol 2015, 15(1):133. Oellermann M, Mark FC, Dunker E: Diffusion chamber for ascertaining different parameters of an aqueous substance. In. : European Patent Office; 2015. Thonig A, Oellermann M, Lieb B, Mark F: A new haemocyanin in cuttlefish (Sepia officinalis) eggs: sequence analysis and relevance during ontogeny. EvoDevo 2014, 5(1):6. Oellermann M, Pörtner H-O, Mark FC: Simultaneous high-resolution pH and spectrophotometric recordings of oxygen binding in blood microvolumes. J Exp Biol 2014, 217(9):1430-1436. Oellermann M, Pörtner HO, Mark FC: Mitochondrial dynamics underlying thermal plasticity of cuttlefish (Sepia officinalis) hearts. J Exp Biol 2012, 215:2992-3000. MacDonald JR, Oellermann M, Rynbeck S, Chang G, Ruggiero K, Cooper GJS, Hickey AJR: Transmural differences in respiratory capacity across the rat left ventricle in health, aging, and streptozotocin-induced diabetes mellitus: evidence that mitochondrial dysfunction begins in the subepicardium. Am J Physiol Cell Physiol 2011, 300(2):C246-C255. Zuccarello G, Oellermann M, West J, De Clerck O: Complex patterns of actin molecular evolution in the red alga Stylonema alsidii (Stylonematophyceae, Rhodophyta). Phycol Res 2009, 57(1):59-65. Supervision of B.Sc. and M.Sc. students.